A Note to My Readers: I may not be the “Lone Ranger” here, but I am fortunate to be the custodian of a great many family treasures including my maternal great grandparents’ family bible circa 1867, a myriad of cabinet cards, Victorian trading cards, a key to the city of Auburn, NY presented to my mother, my parents’ marriage ceremony booklet, a panoramic photo of a 1929 Tyler Kindred of America family reunion and an 1896 fraternal order ribbon badge to name a few. Most all photos are from my mother’s side of the family which includes a few reproductions of the originals that are in the possession of cousins. My mother was hugely sentimental and the ‘keeper of memories’ and she passed the torch on to me. My father died when I was ten and there was some Martin family time with his kith and kin, but it did not have the bonded blood-to-blood tribal love that imbued every Purdy gathering. Accompanied with singing and gossiping, cigarettes, cocktails, bosoms sporting expensive perfumes and glorious shades of lipsticks that marked cigarette butts and children’s cheeks, nothing was done in small doses in my mother’s family. Especially reminiscing. Along with the affectionate and dramatic Purdy panache, I was provided with enough memorabilia, photos and lore to know my mother’s side and to begin to build a worthy maternal family tree. Not so with my father. I barely had time to know my father and having no knowledge of my paternal history was something that challenged me from the very beginning. It also gave me one of my first and ongoing brick wall mysteries. Failing to find her information in the Brooklyn area, I went back to her hometown of Auburn, New York. Burial records for North Street Cemetery in Auburn, NY are full of gaps of information. The maintenance of the grounds and records have a terrible history, but I do have records of most of the burials in the Jennings family plot as recorded in an old sexton’s log book. In addition, I have the obituaries of her father, Daniel and sister, Harriet Jennings White that state their burials took place in North Street Cemetery ‘in the Jennings plot’. Lillian is not listed among them in the book and no stones remain to mark any Jennings burials due to scores of years of vandalism and lack of care. Painstakingly searching through Auburn, New York newspaper articles for any Jennings or Martin mention, I had no trouble finding information on her Jennings family members including death notices and obituaries. Why not Lillian? Her husband’s Martin family lived in Auburn and they never failed to show up in the local newspapers. Only Lillian’s 1884 marriage to my great grandfather surfaced in an Auburn, NY newspaper article. Lacking any more avenues to find Lillian, I decided to open up the research to her siblings. Perhaps there was a clue awaiting me among the Jennings kin. I began with Lillian’s sister Emily Russell Jennings Trowbridge and brother William H. Jennings. Trowbridge & Jennings Art Store in Auburn, New York. Lillian’s oldest sister, Emily Russell Jennings Trowbridge, lived in Auburn for decades with her husband and three children. 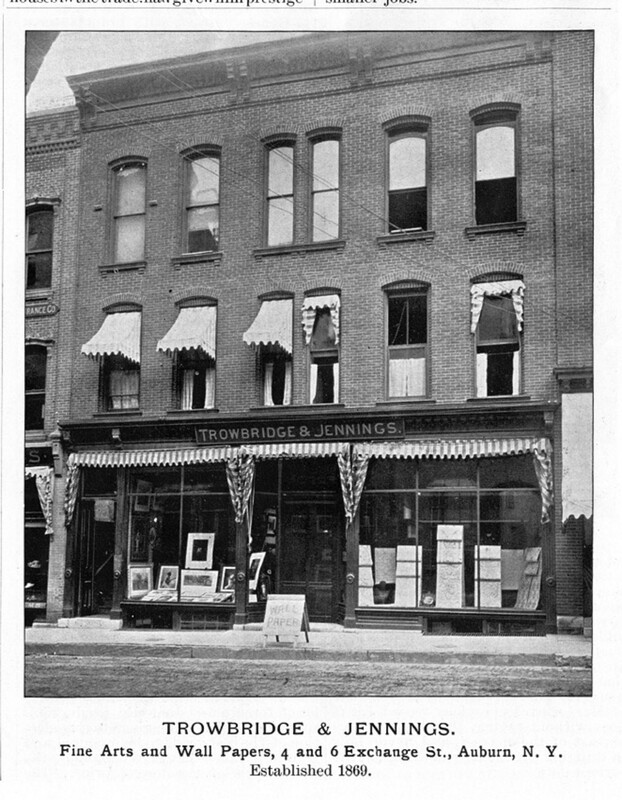 John Jasper Trowbridge in partnership with his brother-in-law William H. Jennings owned and operated an art and supplies store in Auburn, New York. Both men were prominent citizens and socially and politically active. Information on the two siblings was an embarrassment of riches. When John moved on to open another store in Binghamton, NY, Will Jennings continued to run the Auburn, New York store with his sons. His new venture was social and business news in both Auburn and Binghamton newspapers. After the turn of the century, the Trowbridges relocated to Orange, New Jersey for a short time as John found a new opportunity to pursue. Eventually the family came back to Binghamton where John had been offered a lucrative position. He and Emily spent their remaining years in Binghamton as did their spinster daughters, Grace and Emma. Son Charles Jasper Trowbridge had fallen in love with socialite Paula Mencken Flugal and the pair were married in West Orange, New Jersey in 1909. Their wedding was reported in the New York Times. A salesman like his father, Charles found opportunity in several places…Philadelphia, New York City, Buffalo, New York, Newton, Massachusetts eventually living in Long Beach, California with his wife and near his married daughters, Ruth Jennings Trowbridge (wife of Graham Hurd Stewart) and Louise White Trowbridge (wife of Philip L. Bruce). I followed Lillian’s nieces and nephew in the hopes that sister Emily’s family would shed some light on her fate. As I considered it, Emily and her family were living in East Orange about the time Lillian and Henry were living in Brooklyn. And about the time she disappears from any records of any kind. Emily would have known about Lillian’s life and death. Possibly they spent time together as the distance was not great. Perhaps West Orange might hold some kind of clue. A long shot to be sure, but as any genealogical researcher can attest, long shots are very often the very weapon that solves a mystery. New Jersey held no revelation so it was back to Auburn. 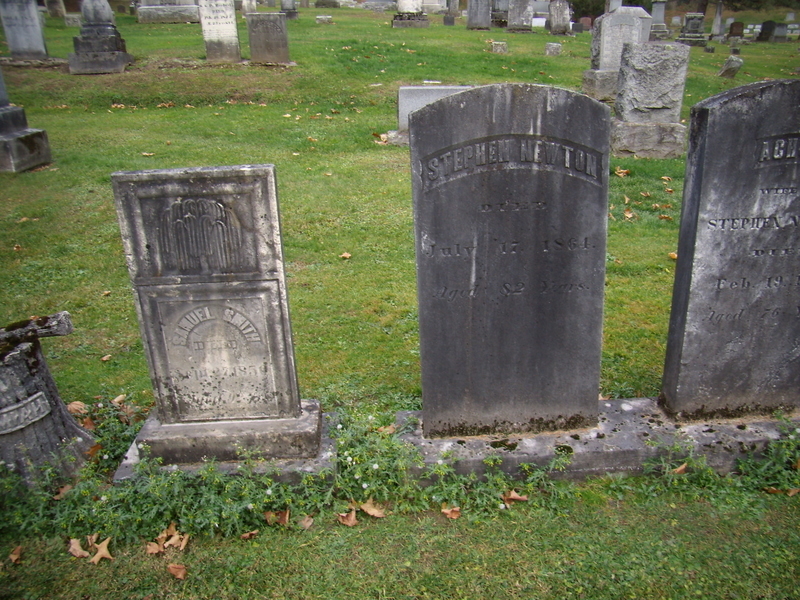 The Trowbridges of Binghamton…Emily, and her husband, John Jasper Trowbridge and their spinster daughters, Grace and Emma were all brought back to Auburn, New York to be buried in their family plot in Fort Hill Cemetery. North Street Cemetery had long been disregarded as suitable and Fort Hill held the ‘new’ pioneer burials with all of the grand monuments. Would Lillian have been brought ‘home’ to rest with her Jennings family members in North Street Cemetery? Could she have died in Auburn and not in the Brooklyn area? Was she buried in Brooklyn or her hometown of Auburn? Nothing. No death records. No burial records. No obituaries or death notices. Anywhere. Just unanswered questions lurking everywhere. Lillian’s fate remains a mystery despite my best efforts. I keep at it…blurry eyed, out of ideas, yet still believing that I will find her. Perhaps that energy and faith lives in the ether. 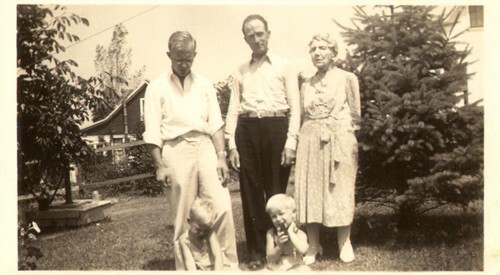 Dad, his Uncle George and Uncle George’s Aunt Harriett Jennings White. Two of my brothers play at their feet. Four generations! One of two Jennings photos I have is one of Lillian’s sister, Harriet Jennings White. She lived in Auburn all of her life and died in 1940. My father visited her quite often and I am fortunate to own the original photo of Harriet taken around 1936 with my father, his Uncle George Martin (my grandfather Albert’s brother) and two of my older brothers. The other photo I have is gift from an individual who found it among her great aunt’s belongings. It is of Grace Trowbridge. Her cabinet card was tucked among her schoolmate’s memorabilia for over a century only to be found by her schoolmate’s granddaughter. She discovered my blog and reading about Emily and her daughter, Grace, sent Grace’s photo to me to once again be part of family. Grace’s cabinet card is framed and hung in my gallery among her extended family members. She is home. Recently I was offered another family treasure…a gift…by another historian who found the cabinet card of Emily Russell Jennings…Mrs. John J. Trowbridge in an antique shop near her home. Vicky is an historian herself and makes a point of rescuing the random orphan image and sets about to find family of the subject. A thoughtful (and kindred) spirit, she dug in to the Trowbridge research and came upon my blog and sent me an inquiry. On the back of the cabinet card is gold stamped “Mrs. J. J. Trowbridge. Binghamton, NY”. Was I family? It was the most stunning moment because I had been looking into my Jennings material at that very moment with the hope that a new source had become available and perhaps I might find Lillian. This was one of those shiver moments. Scoff if you will, but to have the image of Lillian’s sister Emily cross the grand void and find me at that very moment took my breath away. I think I am pretty stubborn…tenacious sounds better…and I hate an unsolved mystery and abandoning an ancestor. What do they say? “Nature abhors a vacuum.” So do I. An incident such as this reinforces my instinct to press on. Emily’s image is now hung in the gallery in my sitting room where I research and where she has joined her daughter, Grace and her sister, Harriett in the Jennings collection. Perhaps some day, Lillian will find her way home. Meanwhile, I adore the image…the very light blue eyes that I sport. I see family so clearly in her face. For the few days it took for Emily’s image to arrive in the mail, I haunted my mailbox. This is when my neighbors question my sanity as I dance to the mailbox in anticipation. Call me a silly and sentimental, but make sure you add genealogist. Then my bit of Terpsichore to check the post will explain everything. *March 30, 2015 UPDATE: I found a death record today for Lillian and Henry’s 14 year old son, Howard. He died in 1907 and was buried in Evergreens Cemetery. I called them today and they confirmed he was in the family plot. As was an “L” Martin. That was Lillian! She was buried there on July 2, 1905. No details on where or how she died and it deepens the mystery since Henry declared himself a widower in the 1900 Federal Census and the 1905 New York State Census. It does make me think that the Lillian W. Martin in Kings Park Psychiatric Hospital is my great grandmother. It was abandoned and the records moved and I have begun the daunting process of trying to find out just where they ended up. The good news is I know where she is buried and that is a sense of closure. A Note to My Readers: Sometimes the research becomes like what my mother called ‘a rat’s nest’. Unattractive, no? Most definitely a challenge requiring me to up my game. Diving into deeper resources and the requirement of constantly honing and improving my research skills. Oh, and note-taking. Lots and Lots of note-taking. Several generations back, I run into my Smith line on my father’s side. (I have one on my mother’s line as well, but with much clearer and more available documentation.) Specifically I am working on the lineage of my paternal 3rd great grandmother, Dorothy “Dolly” Smith Martin. Roswell Smith of Montague, Massachusetts is Dolly’s only brother and his son, Hamilton J. Smith was the ‘go-to” guy for the Smith – Martin genealogy when William Richard Cutter compiled his book “Genealogical and Family History of Western New York: A Record of The Achievements of Her People in the Making of A Commonwealth and the Building of A Nation. Volume I”. Nicely done, as much of Mr. Cutter’s works are, I used the Smith and Martin contributions by Hamilton J. Smith to do my own source work and much to my gratification, everything snicked nicely into place. Still, there was the reference to Dolly’s mother – ‘Sally (?)”. Oh, yeah. One of those. A question mark. So Hamilton didn’t know his paternal grandmother’s maiden name. Swell. We genealogists are a greedy bunch. I was handed both the Martins and the Smiths parsed back several generations by Hamilton. Thank you, sir. Now it is up to me to find out about my 4th great grandmother. Sally (?). Checking back to other related family lines and old archives, I worked on finding Massachusetts civil records of Samuel Smith, Dolly’s father and Sally “question mark’s” husband. Back to Montague and Hadley…following the migration. Back and back. Finally I changed my strategy. I went forward and once again into related genealogy publications. How about Dolly’s other siblings, Almena Smith Thrasher or Achsah Smith Newton. Genealogy was a big deal in that generation…good old pioneer stock family pride. And published genealogies. I hit pay dirt with Achsah. Her husband’s family…the Newtons…had published a well cited genealogy book in 1915. Included in the Newton family information was Achsah and her husband, Stephen and their children. And a footnote on one Sally CHAUNCEY, wife of Samuel Smith…Achsah, Almena, Dolly and Roswell’s parents. 2304. STEPHEN NEWTON(6) (Paul(5), Nathan(4), Jonathan(3), Moses(2), Richard (1)), son of Paul and Martha (Newton) Newton of Southborough and Leverett, mass., was born at Southborough, June 13, 1782, and died at Cazenovia, New York, July 17, 1864, aged 82. He married, January 14, 1807, Achsah Smith, daughter of Samuel and Sally (Chauncey) Smith* of Hadley, Mass. She was born at Montague, Mass., July 23, 1786, and died at Cazenovia, N. Y., February 20 1862, aged 76. *SAMUEL SMITH (——–) of Hadley m. SALLY CHAUNCEY. (The Chaunceys of Hadley are descended from Rev. Israel Chauncey, graduate of Harvard College 1693, ordained over Hadley Church 1696, and Re. Charles Chauncey, President of Harvard College.) They had Achsah, 1786, m. Stephen Newton; Roswell, 1788; m. Esther Rice, who were parents of Hamilton J. Smith. My grandmother Dolly Smith Martin also named her first son Chauncey. Two good clues and a good place to start. And on to the next challenge. The Chaunceys of Hadley are documented in their achievements in regards to Harvard and the Hadley Church and there are some Hadley civic records to parse. There are also a number of history books that provide information on Hadley history and with plenty of Chauncey family mention. That said, unlike the Smiths and the Martins, it doesn’t appear these prominent people had anyone interested in publishing a Chauncey genealogy to assist in the process of compilation. Rather there are a larger number of genealogy books with a generation or two of Chaunceys included. They were a prolific and accomplished family and one that a descendant would love to celebrate with a dedicated genealogy publication. Hard to believe there isn’t one…somewhere. The good thing is that Harvard has a plethora of Chauncey material that promises to help me bridge the gap between Sally (?) Chauncey and her ancestral grandfathers Israel and Charles. So folks…several generations later…a Chauncey is going to Harvard. Well, to research anyway. Occasionally research takes you down unexpected paths. I was stopped short today and went where the story took me. The evidence left me with more questions and added to the research load, but I wouldn’t miss these jogs in the road for anything. 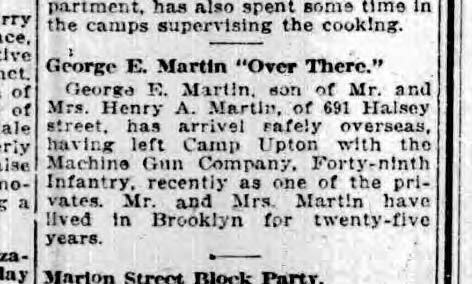 Picking up some loose ends today to see if I can find more Martin descendants, I casually checked back with a number of newspapers to see if there was anything new. And boy, oh boy, I got more than I bargained for. Chasing down the descendants of my great grandfather’s brother, Ernest M. Martin, I uncovered some intriguing material. Ernest, and my great grandfather Henry A. Martin were both ‘stenographers’ and telegraph operators. I hadn’t previously identified their employers. I assumed they were Western Union. Both men picked up and left Auburn in May of 1883 to work as stenographers in New York City. I speculated that perhaps it might have to do with the soon to be completed Brooklyn Bridge since young people from all over the tri-state area were streaming into the city to work as professionals in Manhattan while living in Brooklyn. What I found today has given me pause. I found they were employed in the Auburn, NY offices of stockbrokers Watson & Cox and Co. handling the ‘wire’. Irregularities were occurring at the time and investors were beginning to question what was happening with their money. In 1883 local reporters went to two brokerages and asked them point blank why were people losing money? Watson said it was nonsense…that crops were great and there was no reason for panic. He said that in his opinion, the panicky feeling is the result of a large class of worthless securities being thrown upon the market, which has a tendency, naturally to affect first class collaterals. That is nonsense. The country never had better crops; the railroads are in excellent condition for transportation and there is a general feeling of contentment among all classes. You can put me down as saying that there is no cause for alarm. 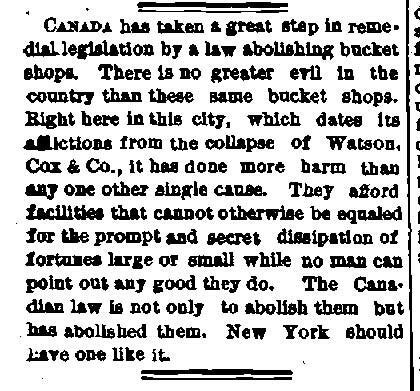 It wasn’t long before Watson & Cox, Co. had closed their doors and the principal brokers were indicted for grand larceny. Though they went through a trial in 1885, they were not convicted. What was of interest to me beyond the intrigue of the economic impact on Auburn’s citizens was the fact that Watson & Cox was affiliated with the NYC brokerage Townsend & Yale that hired my grandfather and his brother and brought them from Auburn to NYC. In 1883. Men who would know EVERY transaction and message in and out of those offices at 82 Genesee St. There is no evidence that Ernest and Henry were called to testify and they both worked for decades as stenographers on the New York Stock Exchange. I also found no evidence that Henry EVER returned to Auburn except to marry in July of 1884. 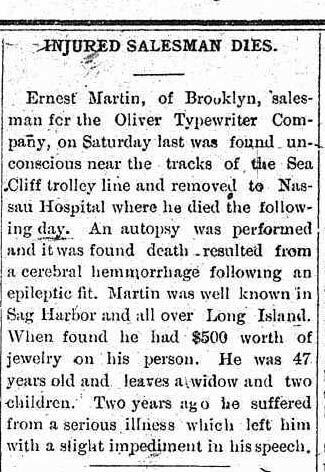 He remained in Brooklyn until his death in 1932. Ernest married his Auburn sweetheart at the same time and immediately returned to Brooklyn. Only Ernest’s wife and daughters returned to visit her parents. The effect on Auburn’s economy was felt for years. There is much to read on the Watson & Cox case. Just collecting it and organizing it has been Herculean. Of course, this means I have a check list. What is a bucket shop? And worthless securities? And even more unsettling…do bucket shops still exist under another name. And worthless securities? Time to talk to an historian about the stock market and the American economy. 2. A brokerage that makes trades on a client’s behalf and promises a certain price. The brokerage, however, waits until a different price arises and then makes the trade, keeping the difference as profit. 1. Bucket shops are sometimes called the boiler room. The U.S. has laws restricting bucket shop practices by limiting the ability of brokerage houses to create and trade certain types of over-the-counter securities. 2. The second definition for a bucket shop comes from more than 50 years ago, when bucket shops would do trades all day long, throwing the tickets into a bucket. At the end of the day they would decide which accounts to award the winning and losing trades to. A Note To My Readers: Yesterday I spent hours in Brooklyn, NY…via my laptop that is. I have been haunted by the fact that I cannot determine the fate of my paternal grandfather’s mother. I know I am not alone in the family secret category. Dad’s family seemed to be one with all manner of voids. Almost like a scatter of chain links. There they are in front of me clearly related…isn’t the material of the same making? And the fabrication distinctly of the same hand? One by one I pick up the pieces and rebuild the chain, noting the beginnings and the endings…watching for the telltale scars and scratches to match the partners. On occasion several links have stayed fast. And inevitably I come to the link that fails to close. Lillian W. Jennings, my paternal great grandmother is that link. My paternal great grandparents, 26 year old Henry A. Martin and 25 year old Lillian W. Jennings, left Auburn, New York in 1884 within days of their July 16th marriage by the Trinity Methodist Church pastor and settled in what is now known as Clinton Hill. They set up household in one of the old brownstones on Waverly Street and Henry went to work as a stenographer. The Brooklyn Bridge had been completed in 1883 connecting the boroughs and Henry rode the trolley into Manhattan. Henry’s brother, Ernest had married another Auburnian, Emma Grace Kilmer, the year before and they, too, had made their home in Brooklyn where Ernest worked as a stenographer and then began selling typewriters in the New York Metro area. Ernest became very successful and with Emma and their two daughters lived in a lovely building in Prospect Park. A long life for Ernest was not to be. He died suddenly on Long Island beside the train tracks after collapsing from a massive stroke. Emma and her daughters, Edna Mae and Grace Harriett, did not stay in Brooklyn, but rather packed up their household and moved to Hempstead, Long Island where the girls grew up and married. The research began with the Federal and NYS censuses supported by Brooklyn directories and newspapers. Addresses were pinpointed in directories in 1887, 1888, 1890 and 1897 and the NYS 1892 census shows the family, Henry A., Lillian W., Al H. and George E. living on Halsey Street in Brooklyn. By 1900 Henry was living in Brooklyn as a ‘widower’ with their four children, Albert, George, Howard and baby Lillian on Jefferson Avenue according to the enumeration in the Federal Census. Just yesterday I found that Lillian had borne another child – a girl – in Union, Hudson, New Jersey (now West New York, New Jersey) on August 12, 1888. My grandfather would have been just a year and half old. But why New Jersey? All the other children were born in New York. Since the child was not in any subsequent census, I can only assume she did not survive. By the 1905 NYS Census, Henry and his children, Albert “Bertie” (my grandfather), George, Howard and Lillian, lived in another brownstone this time on 236 Reid Street. Henry was enumerated as “head” and living with the family was the children’s caregiver “servant”, Henrietta Fischer, a 35 year German immigrant. No marital status category was provided in that census. Henrietta was as close to a mother figure as little Lillian would have. The two travelled together periodically. In 1907 young Howard died in Brooklyn at the age of 14. I never sent away for his death certificate. Perhaps the knowledge of why he died might provide a clue. Or add to the mystery. By 1910 Henry had finally set up a permanent residence at 691 Halsey Street and that year married widow, Mary Giddings. The Martins attended the Janes Methodist Episcopalian Church on Monroe Street. Over the years Henry threw himself into church and civic organizations. At the Janes Methodist Church Henry ran the men’s bible study and served in several capacities with The Valley Forge Council, Jr. O.U.A.M. 76 and the Janes Social Union. George continued to live with his father and stepmother on 691 Halsey until he went off to fight in the 49th Infantry in WWI in 1917 at the age of 26. Uncle George was in the parlance of the time “a perennial bachelor”. I vividly remember his auburn hair…curly and topped with a jaunty beret…sipping tea with my mother and my father’s sister in the big farm kitchen in the 1950’s. He visited…motored was the term at the time…from his Murray Hill home quite often. Always quiet and shy, he was almost delicate. And I thought exotic (he was from NYC!) and kind. After my father’s death, he sent me a set of oils and brushes because he knew that I like to paint. He is pictured in the blog banner with my father and his mother’s sister, Harriet Jennings White. George is buried next to my grandfather, Albert, and sharing a headstone in Fort Hill Cemetery in Auburn, New York. His footstone is the only tender sign of affection I have found. Beloved Brother. Rest In Peace. And baby Lillian? She married Leo Franklin Leonard in 1922 and had three children – all before her father’s death in 1932. She lived within walking distance of her father and stepmother and yet when Henry died in 1932, the only survivor listed in the Brooklyn Eagle obituary was his second wife. No George. No Lillian. No grandchildren. He was referred to as her beloved husband. Odd and sadly detached. And there is no stone marking his grave. Not much mention about Henry’s central New York roots in his Brooklyn life. No notices of visiting his family. Except for a Brooklyn Eagle news article at the death of his first cousin, Will Cruttenden, in 1928 who left him and his central New York cousins to share in a hoarded stash, he seemed removed. Henry’s spinster sister, Harriett Cornelia Martin, kept the family ties together attending weddings and funerals as ambassador of sorts and she traveled to New York to visit her brother. Henry’s daughter, Lillian, was named in Harriett’s obituary. Apparently Henry kept to Brooklyn. And my grandfather, Albert, didn’t. In 1905, Albert Henry was sent back to Auburn to his Martin family and met and married my then 15 year old grandmother, Sarah Leona Penird. In six years, the young father of three was dead by his own hand at the age of 24. A troubled mind. What happened to my paternal great grandmother, Lillian W. Jennings Martin? Genealogists are accustomed to gaps in information the further we go back in our research, but there are occasions when a more recent generation has ‘mystery’ written all over it. And family secrets. Henry did not remarry until 1910, but relied upon two German sisters who lived in their building to care for the children while he went to work in Manhattan. Why was he single for so long a time? Is THAT a clue? Was Lillian really dead? Did she run away? Was she ill in an institution? I found a Lillian W. Martin in a state mental hospital in the 1900 Federal Census and her statistics were fairly close. The age was off by a very few years and this Lillian’s mother was born in Massachusetts and father in NY and my Lillian’s information was the reverse – mother was born in NY and father in Massachusetts. Genealogists understand that a slight variance doesn’t constitute a wrong conclusion. It just puts up a flag. “Caution. Proceed with Care.” But proceed I must. With Care. I cannot ignore the fact that I know that Lillian’s maternal grandmother, Orinda Bennett James, died in an insane asylum in Whitestown, Oneida County, NY in 1852 and my grandfather was so troubled that he took his own life by swallowing carbolic acid in 1911. Pathology…hard as it is…might be this genealogist’s evidence. HIPAA laws might get in the way of acquiring information and researching the Lillian W. Martin in what was Long Island State Hospital at King’s Park . Still…. Earlier this year I sent a request out to the Vital Records Department that covers the NY metro area…and no death certificate is there for her…not before 1900. I have poured over Brooklyn newspapers and Auburn NY papers for some kind of death notice for years now. Nothing. She is not listed in the Evergreens Cemetery in Brooklyn where Henry is buried. Alone. The North Street Cemetery in Auburn, NY has suffered from neglect and record loss…a shameful history story there…so I don’t know if her body was buried in the Jennings family plot. But there were other Lillian Martins who died in the New York metro area and I dismissed them because the death date didn’t neatly fit into Henry’s statement of widowhood in 1900. With this possible clue…this painful clue…the next step is to ascertain if there are burial records for the patients of Long Island State Hospital at King’s Park. I will keep looking in every nook and cranny. It would be like abandoning her if I didn’t. My education on Brooklyn is just beginning…I have two history books on the area since family members on both sides left central New York in the 1880’s to live and work in Brooklyn. Just to get a feel for the Brooklyn of the late 1800’s and early 1900’s. But the personal history is as black and white as the old photos and so very full of shadows. I knew my Grand Uncle George…my grandfather’s brother…and I own one of his lovely landscape oil paintings and my brother has one of his pastels…”The Three Cherubs”…that Uncle George created to celebrate my three brothers. But so very little of his mother, Lillian W. “Lillie” Jennings Martin. Bits and pieces. Art and void. And perhaps madness. A Note to My Readers: Brick Wall. Head Scratcher. Haunting Mystery. There are degrees of frustration that affect family historians as we search for answers about our ancestors. Why did they move west? When and why did they in particular change the spelling of their surname? Why is this child living with a relative and not their parents? What happened in the winter of 1878 when three children died? 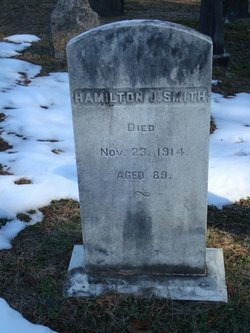 Was THIS man or woman my ancestor or was it the individual with the same name and approximate age…living in the same town? Why does one enumeration say they were from Massachusetts and another Connecticut. Some questions are answered with official documentation while some conclusions can be made through analyzing available evidence. And some clues come from interviewing family members. Or combination of the three. One of the questions that is hard to deal with is “What happened to my grandparent or great grandparent?”. We accept that before centralized record keeping or a diligent family historian’s accounting that some individual’s fate will remain a void in our information. The closer we are in relationship and generation to a forebear, the more we are puzzled and driven to know. Chances are…the disappearance…the lack of information regarding his or her death…is some kind of family secret. 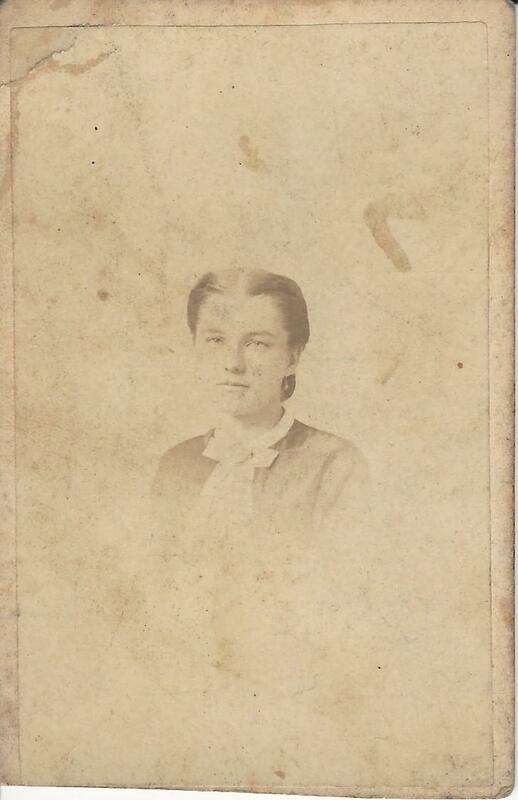 I am working on one of those mysteries…my paternal great grandmother, Lillian W. Jennings Martin. I have dug in with a significant number of resources…obvious and obscure…and spent a good amount of time parsing and analyzing. To no avail. Yet. How much do I invest in finding out what happened to this young woman who died shortly after her daughter was born in 1898? Or did she? I kept a research worksheet for her and the scratch notes clearly show my hope rise at a possible lead…and the burn when it turns out to be fruitless. No death certificate on record in the New York City area. Every borough heard from. No death notice or obituary…in the New York metro area….even in her hometown of Auburn, New York where her large Jennings family lived. No record of burial in the myriad of the likely cemeteries. The last documentation I have of her is the 1892 New York State census living with her husband, Henry and her two sons, Albert H. (my grandfather) and George E. in the 18th Ward of Brooklyn, New York. If I find the facts about her somewhere in my determined efforts and they are unpleasant, I can imagine there will some kind of closure for me. Regardless. I am reminded as I pursue Lillian in the void, the words of French essayist, Joseph Joubert. When go you in search of honey, you must expect to be stung by bees. My parents’ generation had euphemisms or slick diversions in conversation about one individual or another. “Never speak ill of the dead”. “If you can’t say anything nice, say nothing at all.” “Don’t air your dirty laundry.” I am sure we have all heard one or more of those homilies as we have tried to elicit information from an elderly relative about the family history. SOMEONE is always some kind of ghostly presence…acknowledged as a relative, but glossed over in a purposeful fashion. Rarely casual. Family secrets were hinted at, but in the interest of propriety and family pride nothing was said about a “black sheep” or mental illness. Let alone the “D” word – divorce. No feet of clay. No unpleasantness. Perhaps the words “tragic” or “unfortunate” might be expressed. As children, we GOT it. It wasn’t our business and the subject was closed never to be spoken of again. On to the nice memories. If anyone is like me, that leaves some serious gaps. I never did get the courage to ask my mother about the “tragic or unfortunate” ones…or the ones that simply were glossed over. My bad. But then again, she had her own hardships and lived on a plane of pink clouds and only good thoughts with which to cope. To pry at that in search of the truth would have been utterly cruel on my part. My mother’s siblings…my aunts and uncle…were tender and adoring and the warmth and affection I received from them curbed my curious nature to probe their childhood. I accepted the vague references and used them to work through the facts and found answers to their immediate family dynamic outside of sentimentally crafted memories of their childhood. Some of what I found on my own was very revealing. And a bittersweet reminder that we come from a family of human beings. I still have some wonderful stories to embrace and I celebrate that sweetness. My father died when I was ten and we were not terribly close to his family. We had picnics and summer visits along Cayuga Lake. It was noisy with plenty of older cousins, but I forged no deep and personal familial bonding with them after my father’s death. My uncle was a jokester with only the occasional approachable moment. Unlike my mother’s family, my father’s sister was not a ‘warm fuzzy’ presence for me. The secrets were almost palpable in my father’s family history and when I began my research, absurdly public and easy to find. His father’s brother, John C. Martin, was publicly labeled as the Black Sheep in the devoutly Methodist family…stealing from his brother and father and making headlines in the local newspaper. My father’s father killed himself at the age of twenty-four. In front of my horrified grandmother and father who was five at the time. It was a story my mother told me after Dad’s death, but with little detail and a rush to close to the subject. We moved on with the business of daily life never to discuss it again. Once again research revealed the real story was more horrifying and painful than I had ever imagined. What happened to undo my grandfather so profoundly? Drink…like his uncle John Martin. Was there something more? In my case a bridge generation is long gone so getting a clue as to why a young woman simply disappeared…’off the grid’ so to speak…is a reality. Or why her son took his life…despondent. In fact, I am now that bridge generation. The one who can fill in blanks. Some of them anyway. But Lillian? I still am haunted by what I don’t know. Could she have been a victim of Tuberculosis…in an institution…or gone mad and been ‘sent away’? Could her son have witnessed some terrible moment and visited his unresolved turmoil on himself and his young family? My great grandfather was a serious bible-toting Baptist. Divorce is highly unlikely. OR. If he had young children with an incapacitated mother, would he have been given permission by his church to move on? He listed himself as widowed in the 1900 Federal Census and the 1905 New York State Census and remarried in 1910. Even as I write this, the questions and facts swirl in my head…certain that IF I just think about what I know…and what I don’t…and where I might look, a clue might just emerge as to where to look next. It’s just good to remember the bees. Today I am cleaning up my files about my great great grandfathers…one in particular…Albert S. Martin. He was the first Martin in our line to settle in Auburn, New York in 1875. Albert was a boot maker by trade when they left Madison county. He had plied his trade with his older brother, Hiram in Wayne county where Albert met and married Harriet Frear in 1849. While remaining a cobbler, his occupation shifted to selling and repairing sewing machines and selling second hand goods. He and Harriet raised their eight children in Auburn. They belonged to the same Methodist Church I attended. Somehow…somewhere along the way…the knowledge that my Martin family had lived in Auburn was lost to us. I suspect my father knew, but as is true with all of his family history, I had to learn it through research. His father had committed suicide when my father was five…his mother married twice more and I suspect all of that turmoil was packed away in his head…along with the family heritage. And so I have been in search of my Martin genealogy and I suppose recent family history…the dark and light of it along with the names and dates. Reading old documents…especially the old Auburn newspapers. 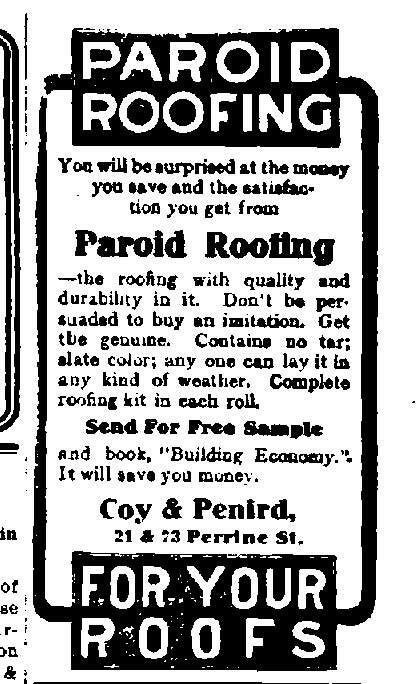 I found my great great grandfather’s display ads…A.S. Martin and Sons…for his sewing machine business. And there were the classifieds buying and selling second hand goods and expanding to repairing bicycles and lawnmowers. On occasion there was a personal item in the social news…a visit from a relative…a church function…a Y.M.C.A speech to the young men of the community on being ‘humble’. The Martins were well known merchants in Auburn with stores located at 136 Genesee Street and later 96 State Street and another on Clark Street. A bicycle shop on Williams Street was run by son, William which was located right around the corner from the Genesee Street “Fancy Goods” store established by Albert’s daughter, Harriett Cornelia. Everyone had business with the Martins at one time or another. The men could repair just about anything and Harriet had a lovely shop with the best of laces and fabrics and the latest in French corsets. William A. Martin’s bicycle shop proved to be the launch of future Martin descendents’ love affair with the automobile. The Springer and Bench families had their roots with William Martin’s venture. My uncle and my father spent their lives in the auto industry…both tinkerers and lovers of anything with wheels. Albert seemed to have trouble with the family horse and came away the worse for wear more than once. He was tipped out of the sleigh on the corner of Genesee and State streets in mid November of 1886 and his horse had to be restrained before it could bolt down Auburn’s main street..overturned sleigh and all. 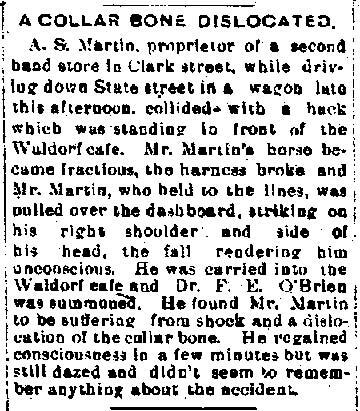 On December 30, 1899 71 year old Albert lost control of his horse-drawn wagon and broke his collar bone when his wagon collided with a hack parked in front of cafe on State Street. Once again his horse proved to be a…uh…nervous Nellie. His horse was reported as “fractious”. Not every Martin was a “transportation” guy it seems. Mishaps with horses aside, Albert had his issues with the characters of the town. He was robbed in his store in 1898 and though an old man, gave the young coat thief a run for his money. However, the story that jumped out occurred in the summer of 1884 in the form of the “Insane Prince of Oranges” when addled Sam Francisco ran down the street of Auburn shouting that “Mr. Martin was going to kill him for losing the keys” and several buildings downtown “were going to burn”. He found his way to my great great grandfather’s home on Seward Avenue and bawling up at the windows at one o’clock in the morning, begged not to be killed for he had no keys. Father and son managed to assure the crazed man that all was well as they soothed him from the second story windows. Eventually quieted, he began the journey home, but his odd and noisy behavior had caught the attention of Officer Malone and the poor man was hauled away. Having had no family lore for my dad’s family passed down through the generations, I found reading these published snippets of activity and moments of drama are worth finding and getting familiar with. Family historians can get caught up with securing evidence…finding proof…data mining and don’t take the time to take a more gentle stroll through the past. If luck will have it, some worthy item will crop up and often does if you are willing to spend time reading. You could find out your ancestral grandfather…a living, breathing human being… had a fractious horse that he could not handle, but could calm a deranged soul dubbed the “Prince of Oranges” in the middle of the night. A Note to My Readers: Recently I brought my car in to be serviced. I have had my lease car for five years…two years beyond the contract. It runs beautifully and due to the ability to work with my clients via the internet, I don’t have the “windshield time” that was usual for me in the past. Thus I have racked up a measly 25, 000 miles in 5 years. Oh, yes, going to the dealership for servicing leaves me feet away from the latest beauties…the ones with WiFi and that new car smell, but I have become curiously immune to the siren call that had me traditionally turning in a low mileage lease car just to drive the newest model. Like clockwork. Every three years for 20 years. The new cars are always so amazing and there is that smell. So what happened? I decided to poll my friends and associates and I was amazed to find out that without communicating, we had all come to the same conclusion. “What’s wrong with keeping THIS one?” And then I learned that the attitude extended beyond the habit and, indeed, anticipation of a new vehicle every three years…for no good reason. My television works…not 3D? Who cares? What sparkles in the showroom…”LOOK! you can see the sweat beads on the quarterback!” doesn’t make anyone pull out the card and add more debt just so that the Monday Night Football experience includes evidence that the players perspire. McMansions that sit on less than an acre are gathering dust on the real estate market as buyers realize that they only live in one room at a time and they can watch movies in the family room without the angst and regret that they don’t have a home theater. And think of the energy that you save! Not to mention the fact that you will actually have to spend more quality time with your family since hiding in a 2000 square foot home is pretty hard to do. Ah yes, technology. Here is where it gets tricky. At least for me. I am an old geek. I love technology and how it makes my work better and keeps me so connected and current. The faster it evolves the more I am concerned about an intervention where I walk into a hotel room to find my family and friends there. In no time I am forced to go to some posh rehab in California where there is no cell phone reception and the utterance of WiFi will have me in therapy with Dr. Drew. But even there, my greedy addiction has been tempered. Products and services are being released every few months and the advance marketing and PR has my inner addict thrumming. Still, I own an iPhone 3. The iPhone 5 is due out. Who cares? My phone works great…does what I need. I play with the iPAD at the Apple store and have had quality time with one or two that belong to family members. But it would be redundant…better…but redundant technology. I have my laptop and function on a high level and I haven’t even used some of its higher functions. Case closed. All of these changes in my attitude about buying new things…just to buy the latest with the whiz bang-something-or-other-life changing-until-the-next-thing-comes-out-consumer-junkie rush…came on without a conscious reality-check effort. And I am not alone. That is what is interesting and, I think, tells me that maybe we have hit the reset button. Back to earlier times in history when fathers handed down their tools to their sons and mothers presented their daughters with an heirloom hair comb. And those things were used and treasured as things of practical value. And worth. When second hand stores were patronized by everyone because good things were still, well, good. This brings me to my great great grandfathers. Albert S. Martin and David Penird. I posted a story in September of 2010 entitled Of Woodchucks and Wookies that was more about my step great grandfather’s hoarding than the practice of scrap, second hand goods of Albert and David. Though I guess it could be a fine line. The difference here is Albert and David were business men who were living the consumer values of the time. Resources were precious things in the late 1800’s and early 1900’s. And there was no middle class stigma to purchasing a “pre-owned” hat or coat, bicycle, pram or child’s toy. The newspaper classifieds were jammed with ads selling farm tools and even personal items. Silver hair brushes were listed in one ad along with homemade preserves and a cow! 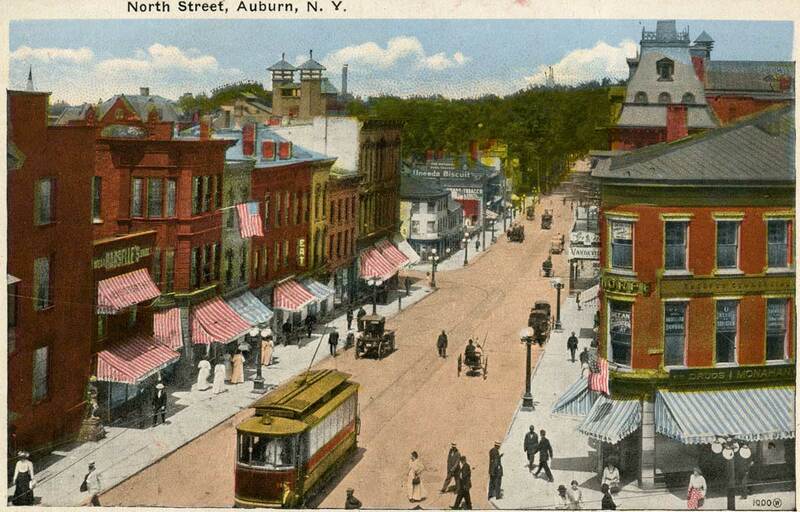 Second Hand shops such as the one my grandfather, Albert, owned in Auburn, New York flourished. They were a place to meet your neighbors as you perused the latest offerings and share the latest gossip. There were no…GASP!…malls…no eBAY…no Craig’s list. Grandfather’s store on 99 State Street was all of that and more. As an agent to sell HOME sewing machines, he was trained to service this all important household tool. In fact, there is a postcard listing his products that belonged to my grandfather that is archived in the Smithsonian Museum. If your shoes or boots were in need of a cobbler, grandfather had begun his young adult life in Cazenovia as boot maker. A quick donning of a leather apron and Albert would render your footwear as good as new. Next door his second eldest son, William, would remedy what ailed your bicycle. I like to think about my great great grandfather’s store. I grew up in Auburn in the 1950’s and 1960’s and I remember the old “shotgun” stores and their shopkeepers as they were then. I imagine the oak floor boards and the big brass cash register and maybe the family dog that was a companion to the old man that spent his last days among the reclaimed treasures. In the 1960’s some of those old premises were invaded by a new generation with slick interiors and on occasion a brash, modern facade to cover the lovely old brick exteriors. I was a kid in the midst of ugly “urban renewal”. The stately manse on South Street, The Women’s Union, was torn down for a parking garage. The Joni Mitchell lyrics come to mind…“they paved paradise and put a parking lot”. And don’t even talk about the terrifying and squat building that once held the old W. T. Grant’s. It sits among the handsome old buildings as a guilty reminder to a human frailty and hubris to replace the past with our own clumsy monuments. On my last visit home in spring of this year, I parked the car and walked the very familiar Genesee Street. The brick exteriors have mostly been restored and many owners are installing new awnings that are in the spirit of those sported by all the buildings at the turn of the last century. I like walking the streets of my youth knowing my great great grandfather and his children did the same. In their day, a narrower Genesee Street went from packed mud, wooden sidewalks to a cobblestone thoroughfare punctuated with iron cast hitching posts, gas lighting and a rumbling trolley traveling its length and finally to its current genesis- a wide ribbon of concrete paving and modern halogen lights. In the midst of the contemporary materials and technology, the new generations have embraced the idea that old is good. And comforting. I am a small town girl. My paternal great great grandfather, David Penird, came to America from London, England in the late 1840’s as a teenager. He began his American life with his New York state born wife, Elizabeth White, who was not yet fifteen. They had settled in Springport, Cayuga County, New York where he worked as a laborer. It wasn’t long before David headed to Cherry Valley, Winnebago County, Illinois with Elizabeth with their infant child, Lucy Jennie Penird. Presumably Elizabeth died, probably from the cholera epidemic that ravaged the population in the valley in 1854. By 1860 David is married to Martha Colwell of Summer Hill with their three children-Ida, John and George . It appears they were married by 1855 as they had a daughter, Ida born in that year. Lucy who is 9 is still with them at the time of the 1860 Federal Census, but on December 3rd of 1860 Winnebago County filed suit against David Penird. Resolved. That Geo. W. Miller to be allowed the sum of Forty Dollars, for care of Lucy Penird, and for sending said Lucy Penird to her friends in Auburn, New York, and the Clerk of this Board is hereby directed to draw an order on the Treasurer for the amount. Lucy Jennie Penird never lived with her father again. If she returned to “friends” in Auburn is not known. What is known is about Lucy’s early years is found in her Steven’s Point Gazette obituary. She was born in Auburn and was living in Wisconsin sometime after 1860 with her aunt, Mrs. Arnold. Lucy became a child bride at 16 to Horatio Theodore Harroun of Plover, Wisconsin. The Harrouns had six children. Their granddaughter, Etta Lawson McCoy, is found married and living in Syracuse, NY and visiting the Penirds. She is named in the 1927 will of her grandmother’s half brother, George Penird. While Lucy seemed to have been acknowledged as a Penird, there is no great sense that she was ever in the bosom of the family. With the prewar economy becoming desperate and a young family to feed, David sold his Illinois farm and found his way back to the lush farmland along the eastern shore of Cayuga Lake in Summer Hill sometime between 1860 and early 1861. In November of 1861 David was paid a bounty and enlisted in the NYS Volunteers 75th Infantry that had been organized at Auburn, NY. Leaving New York State on December 6, 1861, the 75th headed directly to Fort Pickens in Florida. His youngest child, my great grandfather, William, was six months old when David marched off to fight Johnny Reb. David and his regiment saw three years of action in the Deep South fighting major skirmishes in the Red River Campaign and at the infamous Sabine Pass. The 75th was mustered out on August 3rd, 1864 in Savannah, Georgia. During his service, David had attained the rank of Sergeant. Before he left, David had transferred the ownership of the Summer Hill farm in District 9 on Howell Road to Martha. The records are conflicting, but she is named in several records as the farm’s owner. And she is buying and selling land in Summer Hill during those years. Martha worked the farm in Summer Hill and raised her children. When David returned, he was almost 35 years old and had spent three years slogging through malarial swamps. He had learned to be resourceful to survive and distinguished himself in the field of battle. Ten years of being a farmer in Summer Hill evidently didn’t suit 50 year old David because by the late 1870’s he was in Deadwood, Dakota Territory with my 19 year old great grandfather rebuilding Deadwood after the fire and mining along with other veterans of the 75th. When David and William returned to Cayuga County in the early 1880’s, farming was Martha’s bailiwick while the Penird men went into the scrap and rag business. In 1884 William married my great grandmother, Emma Case, of Summer Hill and the Penird men established their scrap business on Clark Street Road. David’s experience in the Civil War – surviving in the Deep South where supply lines were always at risk and scrounging that kept death at bay was a necessity – were dearly won skills. 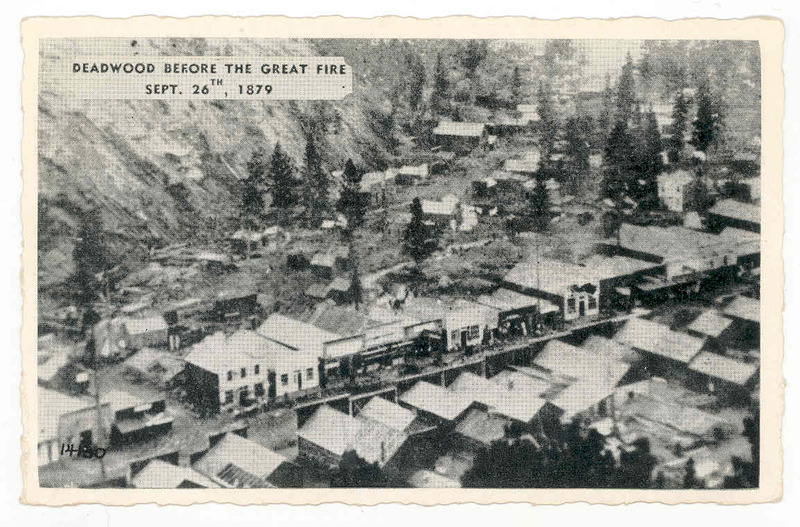 The rough environs of the pioneer mining community of Deadwood taught David and William the value of natural resources and the tenuousness of pioneer supply lines. At first the humble nature of the nouns…scrap and rags…gave me a Sanford and Son image until I read about David traveling to New York to work at “the Exchange” and historic articles about the lucrative “junk business” during that time. The business also included building materials and a retail store for new and used furniture. Auburn newspaper articles were filled with George’s distinguished career as owner of Coy and Penird and his political career as Third Ward Supervisor in Auburn. And there was the fact that George had a chauffeur. My grandfather, William, remained a farmer at heart…with a farm in Aurelius though he was an agent in the family’s business driving his wagon from Ithaca to Groton and Aurelius to Auburn. In 1901 William was killed in a wagon accident on the Auburn Road..now Clark Street Road….just months before his father, David died at his home with George on Perrine Street. George continued the successful scrap business until his death in 1927. During that time, the storage barn was robbed many times…the scrap was as good as cash. One newspaper account that made the point told of a thief that was caught red-handed stealing rags. The enterprising fellow in fact admitted to stealing the rags often and George suspected that he had bought his own purloined inventory over and over again. Albert and David were my father’s great grandfathers. My dad haunted scrapyards all of my life…dragging his little girl who wore pinafores, satin ribbons and lace trimmed socks…to hunt among the rusting automobile relics for treasure. I knew the value of an ivory window crank knob and how to remove it by the time I was six. My father would boost me into the tight spaces (EUREKA! I know why I am claustrophobic!) where I would open his hankie that was tied to my wrist and remove the little tools and begin my automotive postmortem parts removal. I was good at it and it explains so much about me and my penchant for tools and interesting bits of things. 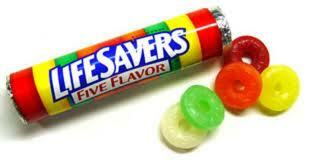 And besides, Dad always had fruit flavored LifeSavers candies to savor on the ride home. A geneticist would probably know there was a gene for such behavior, but I don’t need proof. I know my love of second hand things-first hand.